James VI and I (19 June 1566 – 27 March 1625), the only child of Mary, Queen of Scots, was King of Scots from 1567 and King of England and Ireland from 1603, being the first monarch of the House of Stuart to rule all three countries. His descendants include Elizabeth II of the United Kingdom, Philippe of Belgium, Felipe VI of Spain, Carl XVI Gustaf of Sweden, Margrethe II of Denmark, Harald V of Norway, Willem-Alexander of the Netherlands, and Henri, Grand Duke of Luxembourg. This article deals with numerous descendants of James and his wife Anne of Denmark (Since he is not known to have had any illegitimate children). James VI and I was King of Scotland as James VI from 24 July 1567 and King of England and Ireland as James I from the union of the Scottish and English crowns on 24 March 1603 until his death in 1625. In August 1589, James married Anne of Denmark by proxy and their actual wedding ceremony took place in Oslo, Norway, on 23 November of that year. Although James and Anne were close at the beginning of their marriage, they gradually drifted apart. She had been brought up a Lutheran and converted to Catholicism shortly after marrying James, which was unpopular among the people of Presbyterian Scotland (and, later, those of Anglican England). By the time of her husband’s accession to the English throne in 1603, Anne was the mother of three living children (Henry Frederick, Prince of Wales, Elizabeth and Charles), but had also suffered at least three miscarriages and stillbirths, and had another four children who died in infancy. Their second son succeeded James as King Charles I. Birth 19 FEB 1594, Stirling Castle; Death 6 NOV 1612, St. James Palace, England. Notes: Duke of Rothesay, Earl of Carrick, Lord of the Isles, Duke of Cornwall, Earl of Chester. Died of Typhoid. Birth 19 AUG 1596, Dunfermline; Death 13 FEB 1662, Leicester House, London, England. Notes: Married Frederick V, Elector of Palatine of the Rhine, King of Bohemia 1619-1620. Had 13 children. Birth 19 NOV 1600, Dunfermline, Scotland; Death 30 JAN 1649, Whitehall Palace, England; Burial , St. George’s, Chapel, Windsor, England. Notes: Acceded to English throne upon death of his father on March 27, 1625. Murdered by order of “Puritan” Oliver Cromwell and other insurgents. Trial of King Charles I ||| Last words ||| more links to information on Charles I on the King James VI & I index page. *King James VI & I is not known to have had any illegitimate children. This chart outlines the descent of the late Princess Diana and Prince Charles from their common ancestor, King James VI & I. The names in red are five of the six godparents of their son Prince William. Please note that some information (such as full names and titles, in some cases) has been omitted for the sake of space. April 9, 2011, H.R.H. Prince William of Wales married Miss Catherine Middleton at Westminster Abbey. They became known as the Duke and Duchess of Cambridge. May 2, 2015, the second child of the Duke and Duchess of Cambridge was born–a daughter, HRH Princess Charlotte Elizabeth Diana of Cambridge at St. Mary’s Hospital in London. She is fourth in line for the British throne: (1st) Prince Charles (her grandfather) (2nd) Prince William (her father) (3rd) Prince George (her older brother) (4th) Princess Charlotte. King James I was a Christian who wanted the Bible in the hands of the common man. Specially commanded the Authorized (King James) Version of 1611 of the Bible. King James was known for his wisdom. He was known as “Great Britain’s Solomon” while he was yet alive. Fluent in Greek, Latin, French, English, and his native Scots. Schooled in Italian and Spanish. Wrote extensively including Basilicon Doron (the Kingly Gift), Daemonologie, and tracts on varied subjects such as “Counterblaste to Tobacco” which condemned the use of tobacco. Counterblaste is considered the first anti-smoking tract. These and many other writings are found in The Workes of the Most High and Mightie Prince Iames (in Jacobean typography, the letter “I” can represent I or J), a massive collection of the king’s writings now online. In The Workes, one finds that King James was a contender for the faith of Jesus Christ and cared about the spiritual well-being of his kingdom. He even wrote Christian meditations for his people. His writings are still relevant today–King James has a message that Rome does not want you to hear. William Shakespere was one of his subjects. Learning and writing thrived under the King’s reign. Formed the foundation for what is now known as the British Empire by uniting warring tribes of Scotland and then enjoining the crowns of Scotland and England in 1603. He was the first to call his new kingdom, “Great Britain”. 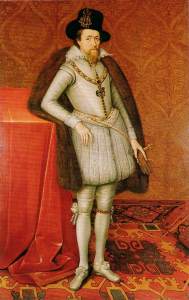 King James was became King of Scotland in 1567 when he was 13 months old and acceded to the English throne in 1603. Scottish reformation leader John Knox read the sermon when he was crowned King. He endured racism as a Scot ruling over the English, nevertheless had the love and admiration of many subjects. Years after his death, detractors tried to sully his good name. Unfortunately, it continues today, yet KJV translators, yea the King himself had predicted such. King James was sickly having crippling arthritis, weak limbs, abdominal colic, gout, and a number of other chronic illnesses. He also had physical handicaps which affected his legs and tongue. Coupled with numerous attempts on his life, he required constant attention and watchcare. His mother was Mary Queen of Scots who was deposed in 1567 and executed in 1587 after 19 years in prison. His father, Lord Darnley, was murdered in 1567. Advice to his son on how to treat his wife. The queen shooting a deer mistook her mark and killed Jewel, the King’s most special and favourite hound; at which he stormed exceedingly awhile; but after he knew who did it he was soon pacified and with much kindness wished her not to be troubled with it for he should love her never the worse; and the next day sent her a diamond worth ï¿½2000 as a legacy from his dead dog….The Queen by her late pacification hath gained Greenwich. It is an honor to come before you on this special day and offer these words honoring our veterans who are with us, and those fallen heroes who gave the ultimate sacrifice for freedom. It is also a privilege to remember with you our loved ones who have left this world before us. The first Memorial Day was not called Memorial Day. It is believed to have been celebrated with a parade of freed slaves and Union soldiers marching through Charleston, South Carolina in 1865. Waterloo, New York, is considered the official birthplace of Memorial Day because after it was observed there on May 5, 1866, General John Murray and General John A. Logan called on all communities to honor the war dead every year. Memorial Day….What do you think of when you think of Memorial Day – the beginning of summer vacation, barbecues in the back yard, family get-togethers, maybe you are looking forward to the Indy 500? It hasn’t always been this way. In most churches Memorial Day is ignored because it is not one of the holy days on the church calendar. But I believe that it would be good for us today, May 26th, 2014 to consider what Memorial Day really represents, for its very name calls us to remember. The ability to remember is a wonderful gift God has given us. In a flash we can be a child again, skipping rocks across a pond, or walking in a meadow. Through memory we can fall in love, get married, & enjoy our children all over again. All this is possible through the blessing of memory. Some of our memories are happy as we recall wonderful experiences. But some are sad, & we may weep as we remember them. Memories are also very practical. If we couldn’t remember that a red light means “stop” we’d be in trouble. If you weren’t able to remember what day it is, or your anniversary or wife’s birthday – you’d be in big trouble. So yes, memories are practical too. “Greater love hath no man than this, that a man lay down his life for his friends. Memorial Day grew out of the human need to remember where we have been. Only then can we figure out where we are going. The cherished memories of a nation, a town, a church, or a family provide the values and dream that one generation passes on to the next. Forgetting means dropping the torch. All of this was on the mind of President Abraham Lincoln on November 19, 1863 as he made his way to the Pennsylvania battlefield. He feared that he might be the last president of the United States. After a three day Battle in the fields of Gettysburg, PA during the Civil War; the country teetered on the brink of self-destruction. The ceremony that afternoon would dedicate the site of the cemetery for the over forty thousand soldiers killed at Gettysburg in the three-day battle the previous July. Lincoln’s remarks provided the seedbed for what would become Memorial Day. The speaker before Lincoln, Edward Everett, was one of the most popular public speakers of his day. He spoke for two hours. Yet Everett admitted to Lincoln, “I wish that I could flatter myself that I had come as near to the central idea of the occasion, in two hours, as you did in two minutes.” Lincoln’s own words would not fall true…he said, “the world will little note, nor long remember what we say here,” however his 2 minute speech continues to echo in the American memory. Even I as I began sharing portions of Lincoln’s speech — the Gettysburg Address with you…you were recalling it and perhaps were saying it with me. Over the next few years, many communities set aside special days to honor the fallen soldiers of the Civil War. Some services were held with little fan fare. Others involved marching bands and speeches. All included decorating soldier’s graves with flowers and flags. Most towns referred to the event as Decoration Day. After World War I the day expanded to honor the American heroes of all wars. Gradually the custom of decorating the graves of relatives and friends became a part of the day. Eventually the official name was changed to Memorial Day. Originally, the day always fell on May 30. In 1971 congress moved the date to the last Monday in May. Why Memorial Day? Because we don’t want to forget. What do we remember? Today is Memorial Day. Memorial Day is a holiday set aside to remember certain events and certain people in history. We especially remember those who have died—those close to us: parents, grandparents, children and loved ones. We also remember those who have been taken in war or other tragic events. The freedoms you and I enjoy today have come to us through tremendous sacrifice. The right to keep and bear arms, the right to own property, the right to come and goes as we please, the right to speak our mind without fear of being arrested…the right to worship God or not to worship God in any manner we choose…all of the privileges and rights we enjoy today have been made possible by men & women who gave a sacrifice beyond measure. “It is well that war is so terrible, or we should grow too fond of it.”—. Let me emphasize these words to you “freedom isn’t free.” Every freedom we enjoy as American’s was purchased and has been preserved by many who paid a sacrifice beyond measure. The freedoms we enjoy were not free! “A person may be dead and buried, but if we are lucky they will never be forgotten.” I thought it was interesting that she said, “IF WE WERE LUCKY.” If WE are lucky…shouldn’t it be if THEY are lucky? I wasn’t exactly sure what she meant. Then she went on…”it was her 72nd birthday, on March 3rd, 1012 when my Nana took her last breath on earth and her very next breath she took in Heaven. A grave marker or a tombstone is not my Nana and it is not your loved one. I watched my brothers and my cousins carry the box that held the body that once held the life of my Nana to the place where she would be buried. Her marker will serve as a memory of her. It is important to me and I know that your loved one’s marker is important to you. But remember, nothing lasts forever and these markers will not be here forever either…I will never forget my Nana…” WOW! I should have just repeated my daughter at the beginning of my message and I would have been done! I want us to remember the words found in the Gospel of John, the 15th chapter, versus 13-14. Those were the very Words of Jesus Christ. I want us to remember, who gave His life for His friends…gave His life out of love. Please, this Memorial Day, as you lay flowers and wreaths on the graves of soldiers, family members and friends…as you partake in family BBQs…the Hamburgers, Hotdogs and the watermelon: Please remember the ULTIMATE SACRIFICE that took place 2,000 years ago just outside the City walls of Jerusalem on a hill called Calvary. The death and resurrection of Jesus Christ was the most significant event in all history! God Bless all of you…thank you so much for having me…enjoy the rest of your Memorial Celebration. Today’s article will be short I hope. I am watching the Ken Ham of Answers in Genesis & the Bill Nye Pre-Debate show. I watched this debate…I purchased the debate on DVD. To be honest I was a bit disappointed. I expected more out of Bill Nye The Science Guy. What did we learn from this debate? Bill Nye is NOT a Science Guy and God did it. I understand Ken’s position, I just would have hoped he would have supported his opinion with facts. There are plenty of facts that support God did it. Perhaps I missed them…I will watch the debate again. His shows are relatively entertainment and there is some information. (I’ll show you a clip in a minute). I have a question? How much prep time does Bill Nye need for a 23 minute children’s science show? A Christian Brother of mine…you may know him. His name is James L Georgeson. This is a man that I became antiquated with Mr. Georgeson in the winter of 2012 when his young sin was murdered by U.S. Marshall’s. Mr. Georgeson’s life was just ripped in a million pieces with no chance of ever recovering the pieces in order to re-assemble it. I reached out to him and he asked me to do a Bible Study in my home. It was clear after the first meeting he was not ready for this sort of gathering. I then invited him to a grief support group. This too lasted perhaps for one or two sessions. Shortly after this, he completely pushed me away. I knew his grief was almost too much for him to bear. He pushed everyone that loved him away. I continued to pray but gave him the space he so desperately needed. Finally, we reconnected and I could immediately see changes in him. He was quick to point out his walk with Christ was better than it has ever been and he was hungry for Biblical knowledge. Just today he asked who John was talking about in Revelation 6:2. I quickly said, Jesus Christ and used Revelation 19 and Psalm 45 to support this. He was reading a book and the author claimed it was the antichrist. I am aware that some Contemporary Bible Expositors agree with this teaching. I simply disagree. How long did the author of the book that Mr. Georgeson was reading have to research before he wrote the booklet? When I was in the Army I read a grand book on rock climbing. This was the ABC’s of Rock Climbing…it had everything from selecting equipment, preparing rigs to tying knots. DOH! I read a book! I was not an expert….not even close and to be honest, I WOULD BE AFRAID TO ROCK CLIMB WITH ME. How long did it take for me to research rock climbing before I could convince others that I was the man to go with…that I was the man to keep them safe? Now, please don’t mix words with me. He doesn’t actually have to SAY he is an expert. I never once told those army buddies that I was an expert rock climber. Our actions can say it. You know, ironically, that fella in the army that said he wanted to go with me, his name was Darrin O’Sheilds. Today, he lives in Washington D.C. and he works for S.W.A.T. — in fact he trains them! One of the skills he teaches is rock climbing and repelling. Psalms 118:8 – It is better to trust in the Lord than to put confidence in man. I say unto you…TRUST NO MAN….TRUST NO EXPERT. I think that it is safe to say that Jesus is not big on titles…and He even forbids the use of some. Put your trust in the Life Giver.